The IWS PAC series is the new generation WinCE 7.0 based InduSoft PAC of ICP DAS. 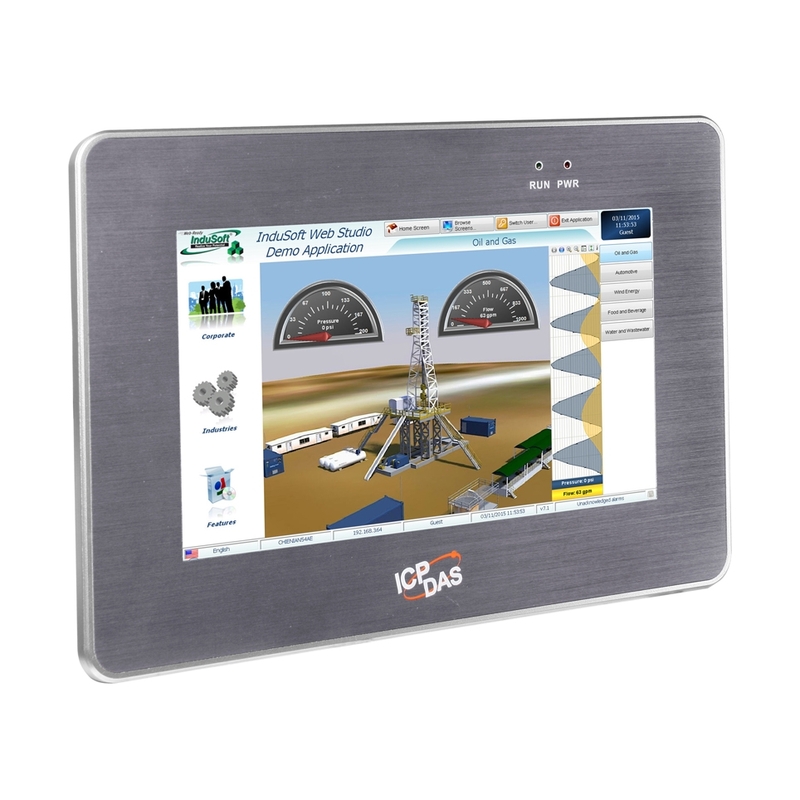 It combines a RISC-based CPU board, TFT LCD touch screen to create a ruggedized, flat panel computer perfect for a variety of control and HMI applications. It provides a variety of connectives including Gigabit Ethernet, USB port, RS-232 and RS-485. The operating system is pre-installed in the on-board Flash memory. Remote I/O expansion is available using our Ethernet I/O modules, RS-485 I/O modules, Wi-Fi and ZigBee wireless I/O modules. Designed for panel mount installation, the front panel is NEMA 4/IP6 5 rated and can withstand sprayed water, humidity and extreme dust. Designed to operate over a wide -10°C ~ 60°C ambient temperature range, the fanless design offers the ultimate in reliability with no moving parts. In addition to the many alarm functions you expect from InduSoft Web Studio,v7.1 also sends online alarms or reports using multi-media formats like PDF.Alarms are real-time and historical; log data in binary format or to any database.Use remote notification to have alarms sent right to your inbox, printer,or smartphone! Custom Alarm fields allow you to customize up to 10 additional fields to the history of alarms. Real-time and Historical trends, and SPC functionality are supported.Log data in binary format. or to any local or remote SQL database. Color or fill trends with graphic elements to enhance clarity of data. Date/Time based or numeric (X/Y plot) trends give you the flexibility to display information that best suits your application. InduSoft Web Studio supports vertical and horizontal trending. Connect to any SQL database (MS SQL, MySQL, Sybase, Oracle), or MS Access or Excel, and ERP/MES systems (including SAP), even from Windows Embedded CE.InduSoft Web Studio is flexible, offering a built in interface that doesn’t require knowledge of SQL (for trends, alarms/events, grid and other objects). Use any SQL statement you need, anywhere you need it. Remotely view screens as web pages using Internet Explorer web browser, or InduSoft Secure Viewer. Without installing any additional software and provide embedded firewall, remote client command disabled and login authority functions to protect the system security. things” and mobile devices easily.